Here is a tutorial that I created for the 2016 Stash Bee (hive 3) but I wanted to host it somewhere here on my own blog as well. 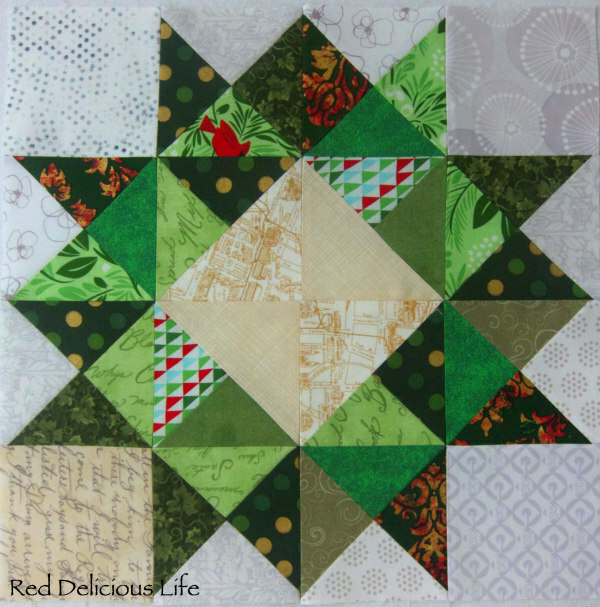 I originally found this block from Popular Patchwork but I changed the size. Enjoy! 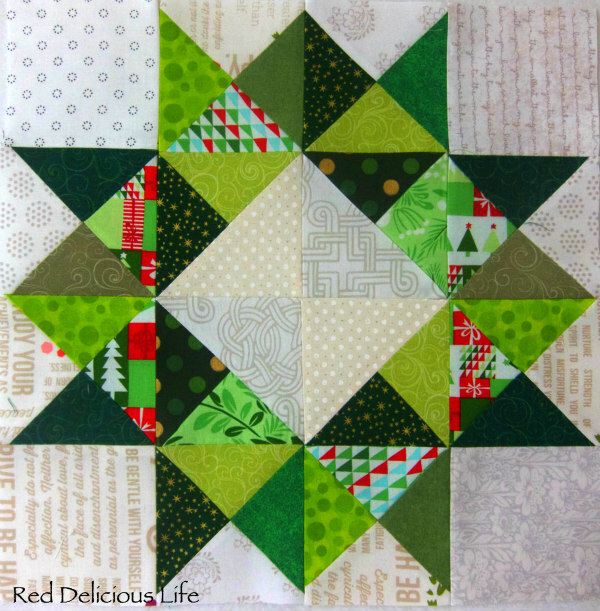 This block will measure 14.5" (unfinished) and is made up of half square triangle (HST) blocks and hourglass blocks (sometimes referred to as quarter square triangle (QST) blocks). If you're comfortable with making these, then you're going to breeze through this. But don't worry if they're new to you -- I'm going to walk you through everything step by step. Also, I've made this precut friendly, using 5-inch charm squares. 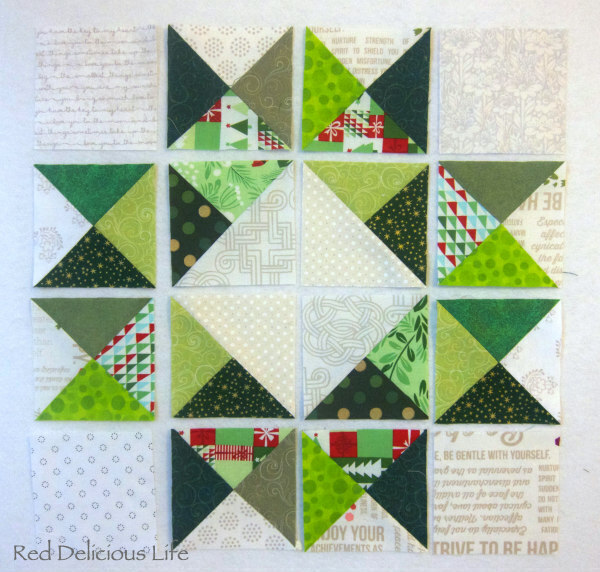 8 colored 5-inch charm squares - these can be green, red, a combination of both, or a cheery holiday print. 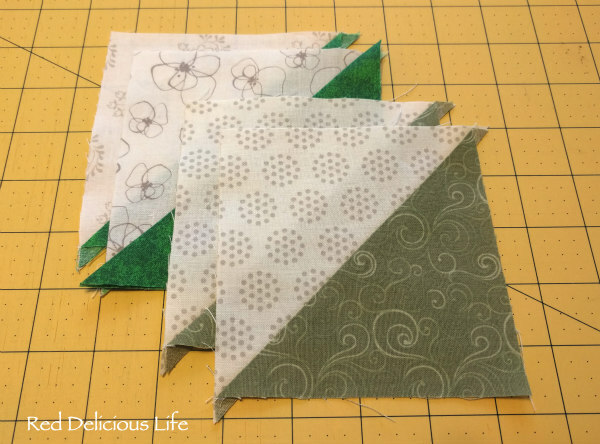 This pattern works best with at least 4 different fabrics, or you can make each charm square a different fabric. 8 background 5-inch charm squares - I have a large stash of low volume charm squares so that is what I used for mine. Cutting note: if you're using yardage instead of charm squares, 4 of your background squares can be cut to 4" x 4" as these will be the corner blocks. 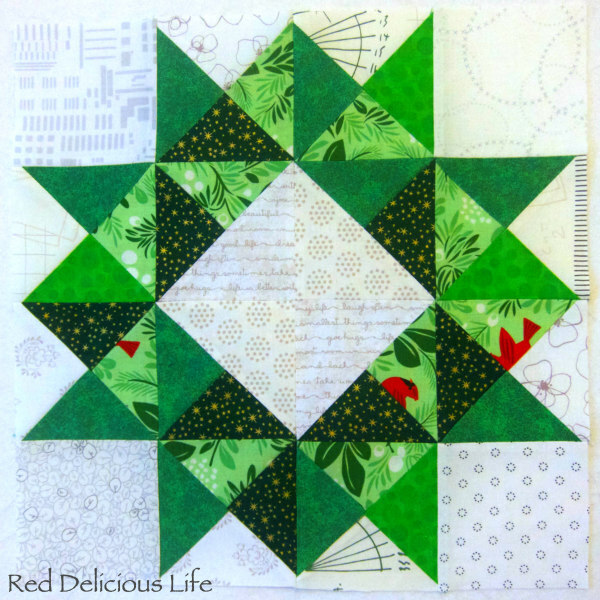 We need 3 sets of colored HSTs so choose 6 prints and pair them together, placing right sides together. On the first pair, draw a line down the diagonal of the square. 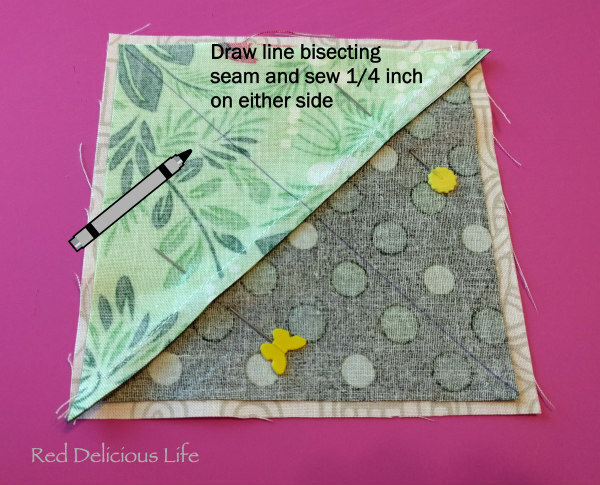 Sew a 1/4 inch on either side of the line. Don't worry about trimming any of the blocks yet. I'll have you do that once we get all the units pieced. Take your 2 remaining colored print charms and pair them each with a background 5" charm square. 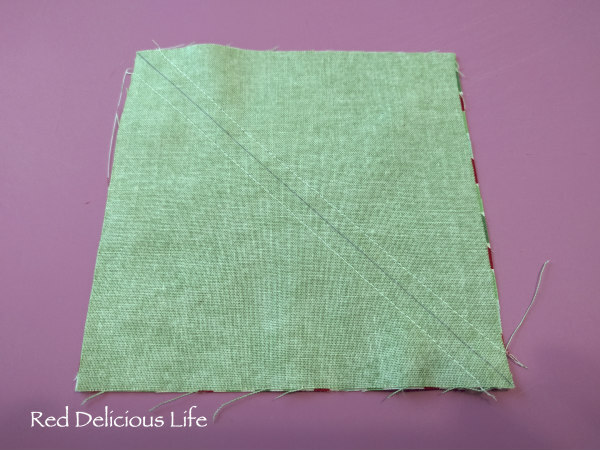 Just like before, draw a line down the diagonal of the square, sew a 1/4 inch on either side of the line, cut and press. 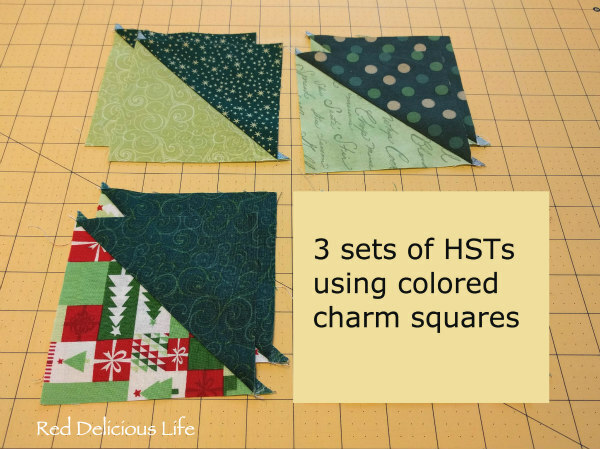 Select 2 of the colored HSTs and pair each of these with a background charm square. The HST will be slightly smaller than the background charm square, so just center it. You will draw your line diagonally on the colored HST bisecting the seam. Again, sew a 1/4 inch on either side of the line. Cut on the diagonal line (between your stitching) and press to the background side. These will become the center of the wreath. Set aside. The 4 units that will make the center wreath. We will now be pairing up the remaining colored HSTs (4) with the background HSTs to make hourglass blocks. Place a colored HST right sides together with a background HST, lining up the seams. If you pressed your seams to one side, they should nest up together. 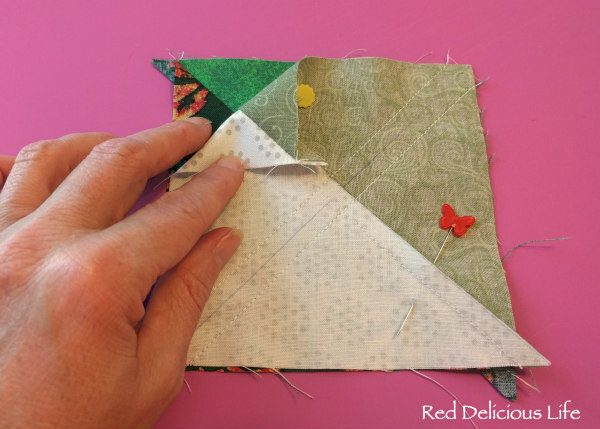 Pin in place and draw a diagonal line bisecting the seam. Sew a 1/4 inch on either side of the line. Cut on the line and press seams open to reduce bulk. Repeat this for the other 3 sets. You should now have 8 hourglass blocks. 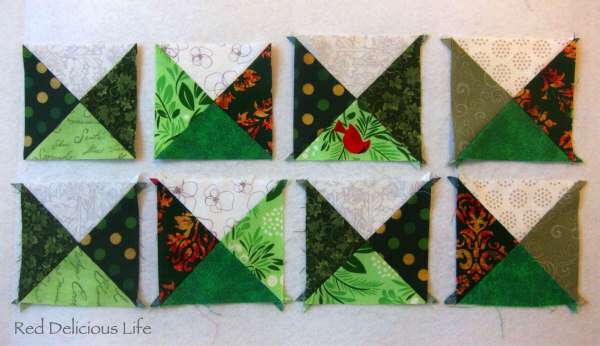 All of your block components are now sewn, so the last thing to do is trim them all to 4" square and sew it all together. Here is how I trim my blocks down to size. 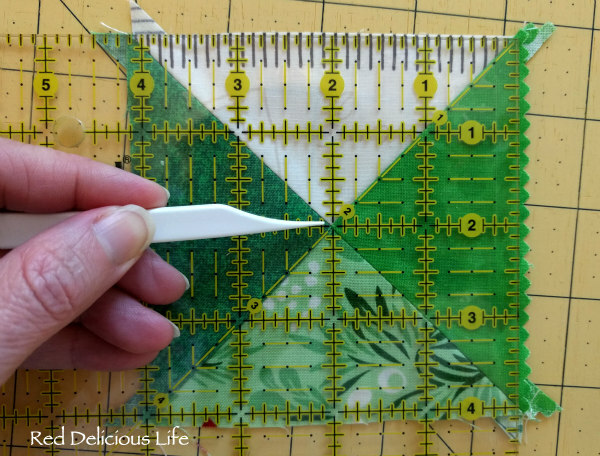 I use a ruler that has a 45 degree diagonal line on it, and lay that on the diagonal of the block and make sure that the 2 inch mark lines up with the center point of the block. I sewed them together in quadrants of 4, pressing all seams open to reduce bulk. 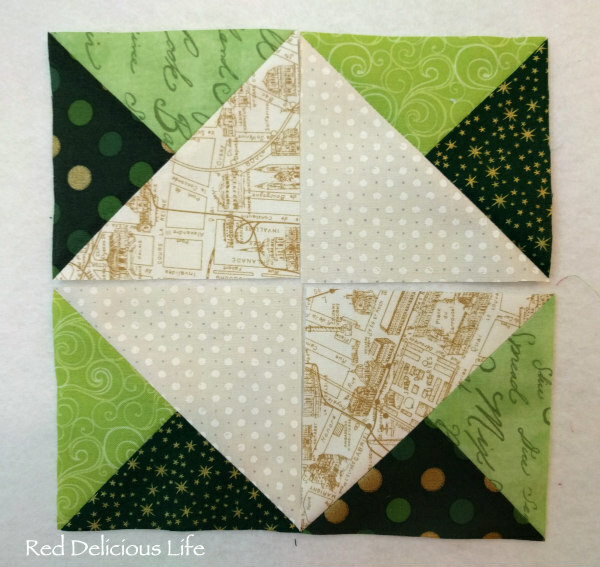 Your finished block should measure 14.5" square. 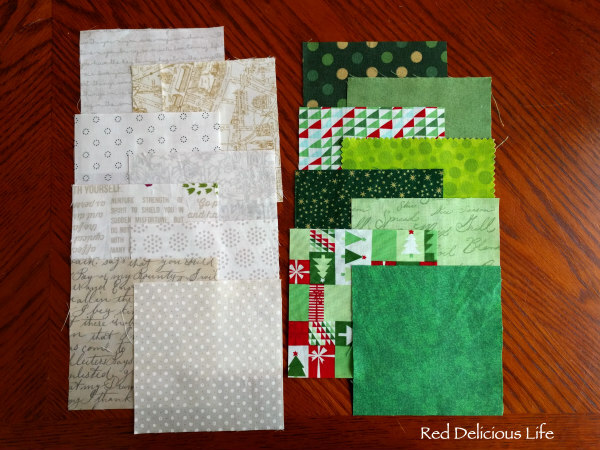 Here are a few other finished blocks in which I used 8 different colored fabrics for an even scrappier look. 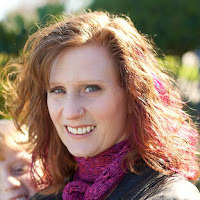 This is a great tutorial and I had fun making one for you! thanks for the tutorial have pinned you too! Great tutorial, very clear and good pictures. I especially liked the little tips you added. Great tutorial with great pointers! Also loving those low volumes, I cant wait to see what you get back. I was taught that hourglass block technique on a retreat when making my dad's shirt quilt. What a lightbulb moment that was! So good to see you sharing it with others. Excellent tutorial! Your instructions are very clear as well as your pics! Oh I love this! Thanks for sharing! Great tutorial, and block, thanks for sharing!